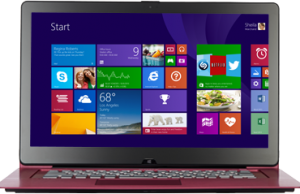 Windows 8 is ready to get updated with a new version called Windows 8.1. As we all know, the Preview of Windows 8.1 is available to download and test. Apart from the performance and security improvements, Microsoft also took care of the negative feedbacks related to the new Metro Style UI and Start Screen. 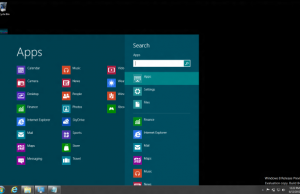 Before Windows 8, all other Windows versions were use to open the desktop after boot but the company introduced Start Screen featuring metro apps showing in a grid view. 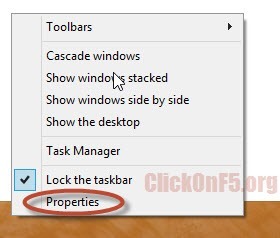 In that case, you need to click on the ‘Desktop’ thumb to open the desktop otherwise you can view the installed apps. The Metro Style Grid View on Start Screen got positive feedback from Mobile or Tablet users but regular desktop users complained because of multiple clicks required to get the desktop view. Apart from the default desktop view after boot, some Windows users also complained about the missing Start button. Finally with Windows 8.1, Microsoft rectified these two things by bringing back the Start button and by providing an option to directly boot to desktop. 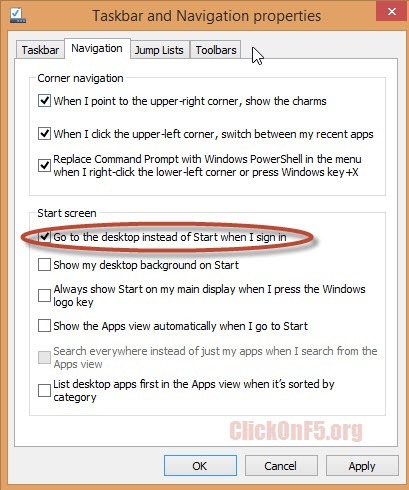 If you want to skip the Start Screen after sign-in and directly go to the desktop, here is a simple step to do the same. Right-Click on the Task bar and select Properties. Click on the “Navigation” tab and check the box “Go to the Desktop instead of Start when I sign-in”. Apply the changes. Now on wards, whenever your system will start, it will open the desktop and not the regular Start Screen after successful sign-in. Windows 8.1 Preview is available to download and test. The final version is expected to release soon and will be available to upgrade for free to all existing Windows 8 users.